Squonk. It’s such a silly word. But it’s a silly word that has forever changed the vaping industry landscape. Once used only by the most die-hard vape modification enthusiasts (that IS where the word “mod” came from, after all), most all major manufacturers offer some form of bottom-feed squonk mods in their lineups. Love dripper flavor, but not all the work and effort? 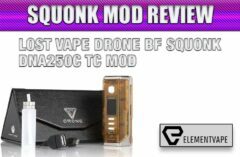 A squonk mod might be what you need. Want the convenience of a tank, but not the limitations? A squonk mod might be what you need. Want a little more control over your vaping experience… yeah, you guessed it – a squonk mod might be what you need. 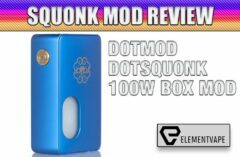 Thanks to some innovation, today’s squonk mods are a lot more advanced than the simple, direct-wattage boxes of yesteryear. 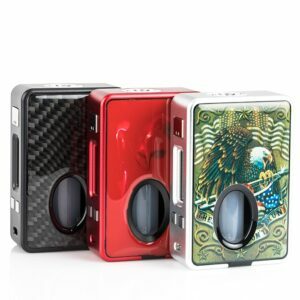 Now, users enjoy similar levels of power, features and customization as standard box mod vapers. And they’re enjoying these things with unparalleled flavor and vapor performance along the way. 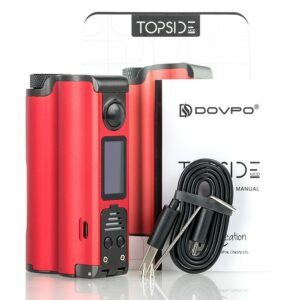 According to our review partners at Element Vape, they can’t keep the Dovpo Topside 90W squonk mod in stock. And for once, even the cynics on this writing staff can understand why. In the short time we’ve had our own sample model on hand, we’ve been floored by how innovative this squonker is – a bold statement considering how little has changed in BF mods over the years. For starters, rather than subjecting users to the often-messy process of dismantling their mods to refill squonk bottles, the Topside offers the first-ever top-fill mechanism. Not only is it the first, but it’s outstanding – to the point where you’ll wonder why some bigger-name vape manufacturer didn’t think of it first. With much of the fuss and mess out of the way, users will find themselves getting some more power and longevity from the Topside, as well. Not only will the 90-watt output give users a little more “oomph” in each draw, but the 10mL squonk bottle and 21700 battery adds a little more length between charges and fills. Perhaps most importantly (to me, anyway) is how solid the Topside feels in the hand. Whereas most squonkers are understandably “hollow” feeling, thanks to the nature of the internal design, the Topside is like a standard modern vape mod, capable of handling some bumps and bruises without even flinching. Internally, you’ll not only get the straight wattage mode, but also a full TC suite, bypass functionality and a wide resistance range, so you can craft your ideal squonk vape. Our office only got one test model – probably because they’re already tough to keep in stock. But I’ve spent enough time with the Dovpo Topside to know that I’ll want to pry it away from my coworkers and never bring it back to the office. A very impressive effort from a company that continues to reinvent itself these past few years. 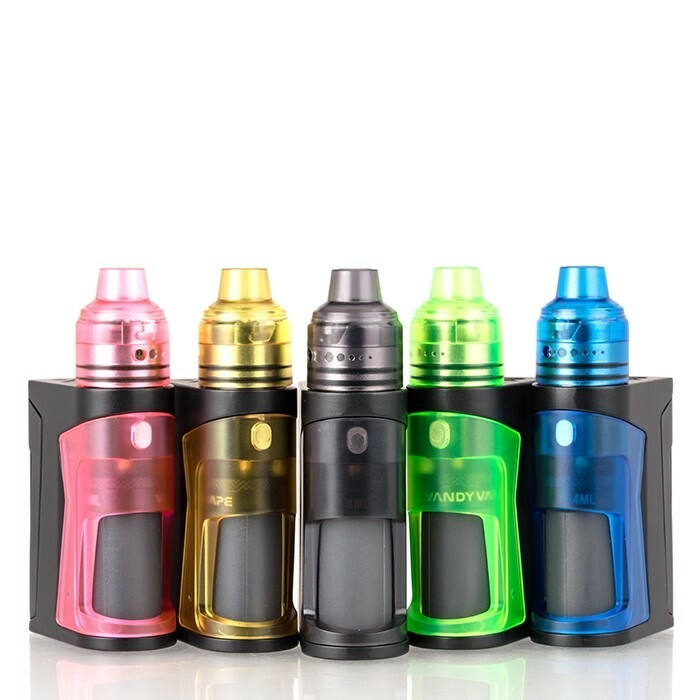 Not to be done by VandyVape, Wotofo has a squonk collaboration of their own – this one featuring the popular Mike Vapes (lucky coincidence on the name, Mike…) – the Wotofo Recurve 80W squonk mod. But after a few smooth, effortless draws on the 80-watt Recurve, my fears quickly disappeared. Using a single 21700 or 20700 battery (18650 and 20650 with included adapters), I enjoyed some of the most effortless, fuss-free squonk vaping around. My fingers may have wanted to reach for adjustment buttons, but the performance never called for it. It just flat out works. It doesn’t hurt that the Recurve also features a VERY comfortable, ergonomic design that hugs the palm of your hand, but maintains a good, solid weight. And the soft-touch rubberized coating only adds to the comfort level after a long day of use. Now, to be fair, we’ve only spent a little time with the Recurve, but what we’ve seen is encouraging enough to warrant being put on this list of top squonk mods of 2018. Plus, it’s so different than most of the other devices on this list that it practically warrants attention on individuality alone. The fact that it performs smoothly and without concern only improves our opinions of the mod. Expect to read a more detailed review of the Wotofo Recurve in the weeks to come. But for now, rest assured, advanced vapers looking for a simple, no-hassle squonk mod should add the Recurve to their shopping lists. We’re pretty sure you’re going to like what you see. Intuitive Firing Button – 100k Click Test. 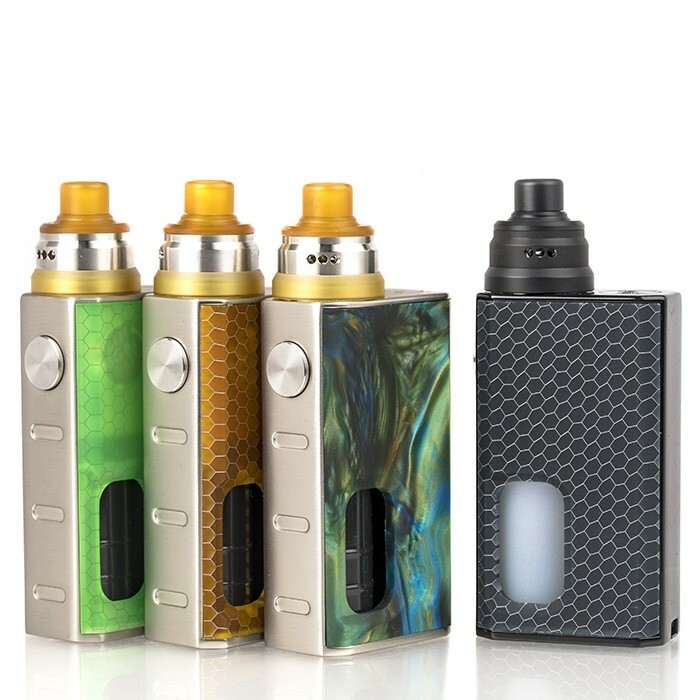 I know what you’re thinking – “Didn’t I just read about the VandyVape Pulse?” Well, read it again, because VandyVape’s all-new Pulse X BF Squonk Kit is here, and it’s designed to right a few of the misgivings that may have happened the last time around. Plus it has a few nifty tricks up its sleeve all its own. Full disclosure: I’ve only just gotten my hands on one, but from what I can gather, it’s going to be a keeper, so I decided to add it to the list. The Pulse X is another in a long line of VandyVape “celebrity” collaborations, this time featuring Tony B. and Stefen Z, who are apparently some heavy influencers in the online vape community. But unlike so many other celeb mashups, the Pulse X looks worthy of the fake signature on the box. And it’s not just because of the 90-watt capability on a single battery. It’s not because of the multi-cell format design. It’s not because of the increased juice capacity in the squonk bottle. It’s because the Pulse X comes with an RDA that makes the absolute most of the squonk experience. The appropriately named Pulse X BF-RDA is a natural match for this setup, with a simple, no-fuss design, and a build deck that all but ensures your coils get maximum e-liquid coverage, with minimal waste. It all starts on the center-feed squonking that cascades juice over your coils, evenly and directly, so they don’t have to fight for liquid from the bottom of the well. Even more interesting is the flow design at the bottom of the deck, which is designed to return e-liquid to the squonk bottle if not used. While I haven’t been able to see this in action just yet, it could be a game changer for squonk mods across the industry. The rest of the Pulse X appears up to the company’s high standards, with solid, smooth-ramping power, versatile build deck, temp control capabilities and more. The Pulse line of squonk mods are always good sellers, but the Pulse X might be the one that makes the hype a little more real. If this piece was called “The Top Ten Most-Used Squonk Mods” then I would have saved this one for our big reveal at the end. Because despite some notable flaws, I find the Nikola Niagara to be one of the most-enjoyable, user-friendly squonk mods on the market. Which is remarkable considering how many features this fledgling company crammed under the hood. For starters, given the form factor, it’s rare to see a dual-battery squonk mods around. And when we do, they’re usually pretty bulky, or take some liberties with other design elements. While the zinc alloy Niagara is definitely a hefty beast, it’s also incredibly comfortable to operate, even when holding for extended periods. Beneath the surface lies 200 watts of power, full temperature control and TCR modes, smart coil identification, strong battery life and much more. 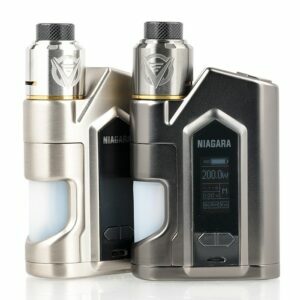 Considering how most squonk mods are big hollow boxes, the stout and solid Niagara really impresses in the feature set. Are there some quirks? Of course – there are no “perfect” vape devices out there. The included RDA is a disappointment, the squonk bottle capacity is a little limited, and some occasional TC quirks left a mark on the initial review. But ask me how much these issues have prevented me from using the Niagara whenever I get the urge for a comfortable, flavorful squonk experience. Hint: They haven’t. Buy the Nikola Niagara with confidence, and see just how far vape mod design has come since squonkers first hit the streets all those years ago. One of the best reasons to use a bottom-feeding squonk mod is convenience. Rather than fumble with extra bottles in your pocket, a squonker can allow users to have everything they need in one device. And, in the iJOY Capo Squonker mod, they get just that – ultra-portable, high-performing convenience that makes you wonder if other competing devices are overthinking things just a little bit. Using the included 20700 cell and 9mL squonk bottle, the Capo allowed me to vape for long durations without having to refill. Even under testing conditions, which caused me to squeeze that bottle a lot. And when trying to find some flaws in the design, there really weren’t any to be had. The outstanding squonk bottle never leaked, and the quality RDA deck never overflowed, even when getting aggressive. Most importantly, the experience never suffered from assertive use – each draw was as flavorful and nuanced as the last, and the included Combo RDA Triangle offered tons of satisfying vapor, outshining many other RDAs I tested on the device. This isn’t a proprietary pairing, but given how well they performed together, I rarely ever swap out iJOY’s offerings – even months later. The iJOY Capo Squonker isn’t perfect, nor is it going to appeal to everyone. But is IS the best, most straightforward, portable and accessible squonk mod I’ve ever used. With a versatile battery scheme, awesome squonk performance, killer RDA and pure ease-of-use, I can’t recommend the Capo Squonker enough. With something as seemingly simple as a bottom-feeding squonk mod setup, it almost seemed like overkill to have an advanced DNA chipset involved in the mix. 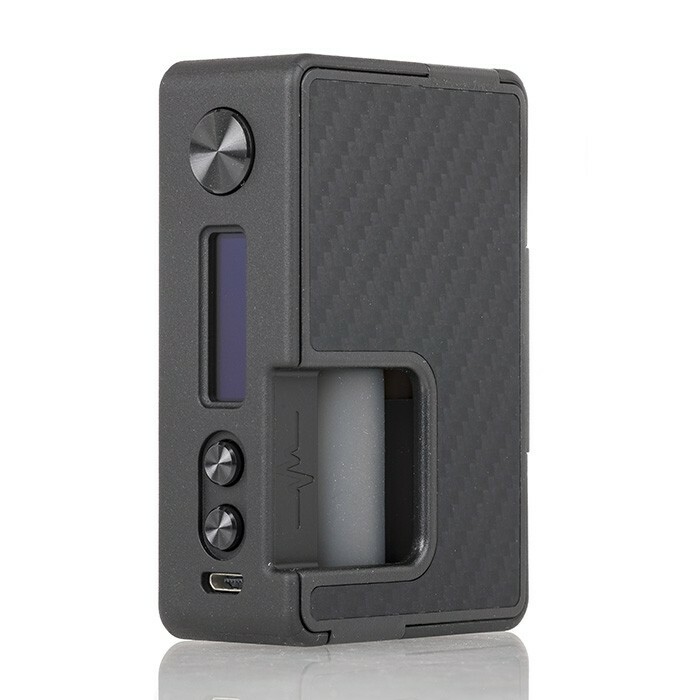 But that’s exactly what Hcigar did with its curiously named VT Inbox DNA75 squonk box. And for the most part, it works really well. 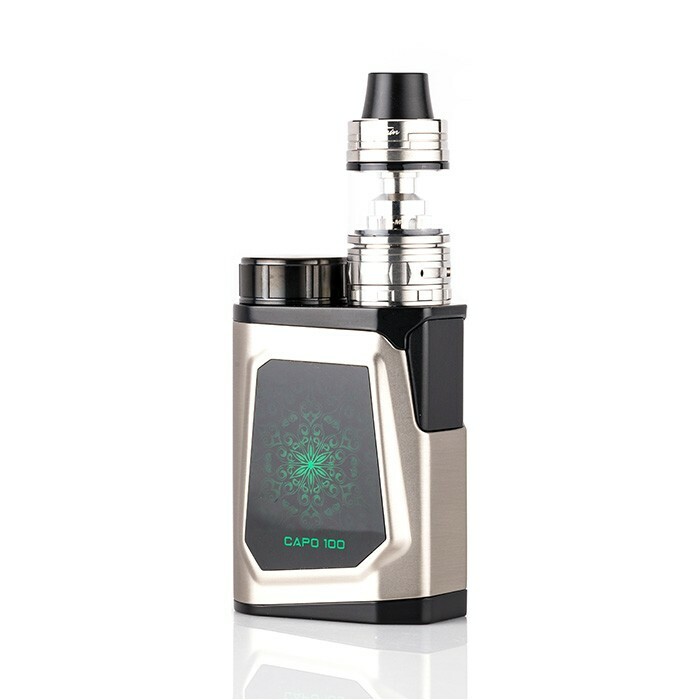 For starters, there’s the inclusion of the Evolv DNA75 chipset which practically sells itself to advanced vaping enthusiasts. 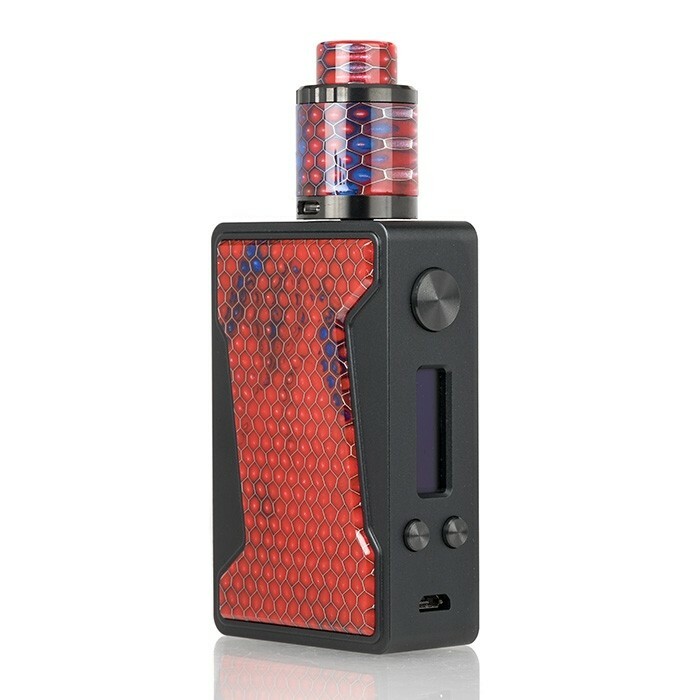 Which must be what Hcigar had in mind with the rest of the design, because the VT Inbox is about as stark and pedestrian as a modern vape mod gets. Though there are replaceable magnetic side panels available to mix up the look and feel, the stock VT Inbox I tested had a solid, but boxy and unspectacular zinc alloy frame, broken up only by a unique splatter design. There were also some concerns about the magnetic door, and some flimsy buttons. And to be completely candid, these concerns remain all these months later. But, at the risk of being redundant, the exterior isn’t the reason Hcigar is going to sell a boatload of VT Inbox mods. Under the hood is likely where the real attractiveness lies. Like I said in my review, the VT Inbox is a damn fine squonker for the money. 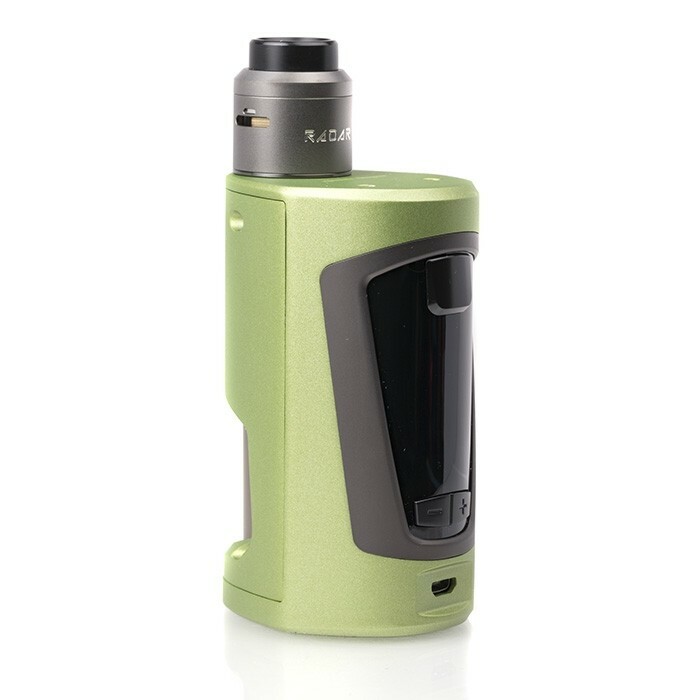 With a proven, powerful DNA 75 chipset, nicely organized bottom-feed setup, and a smooth look and feel, I can see a lot of squonking newcomers making the jump to this style of vaping through the VT Inbox. The GeekVape GBOX might be the most polarizing squonk mod on this list. On one hand, it’s a dual-18650, 200-watt powerhouse with full temperature control and TCR functionality. On the other hand… it might have actually fallen out of your hand, just because it’s so damn big. This size is in place for a reason, though. The GBOX houses a pair of 18650 cells, 8mL squonk bottle, tremendous OLED display, and a full-featured chipset – yeah, that’s a lot of technology for any device, much less one with a sizable squeeze bottle built in. Because it’s rare to see this much power in a regulated squonker, we weren’t sure what to expect from the GBOX at higher wattages. But, the proprietary AS chipset’s comprehensive temperature control suite hit all the right marks, and my various test coils all worked as intended. The same goes for the TCR adjustments and bypass modes. There’s even a VPC mode for vapers looking to expand their feature knowledge a little further. Overkill? Maybe, but no one can complain about GeekVape giving you a half-baked squonk mod, that’s for sure. 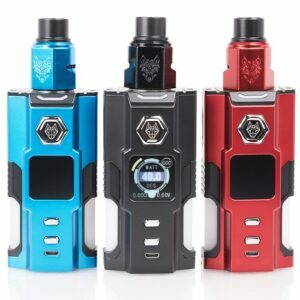 Overall, once users get past the size of the GBOX, they’ll likely realize that the physical dimensions don’t matter nearly as much as the smooth, fast-ramping vape the mod provides. I can only speak for myself (well… and my Spinfuel VAPE colleagues) but of all the squonkers we test, the trusty, commanding GBOX still gets plenty of use each week. Okay, we’ve spent a lot of digital ink discussing “features” and “modes.” But there’s still plenty to be said for the proverbial way things used to be. 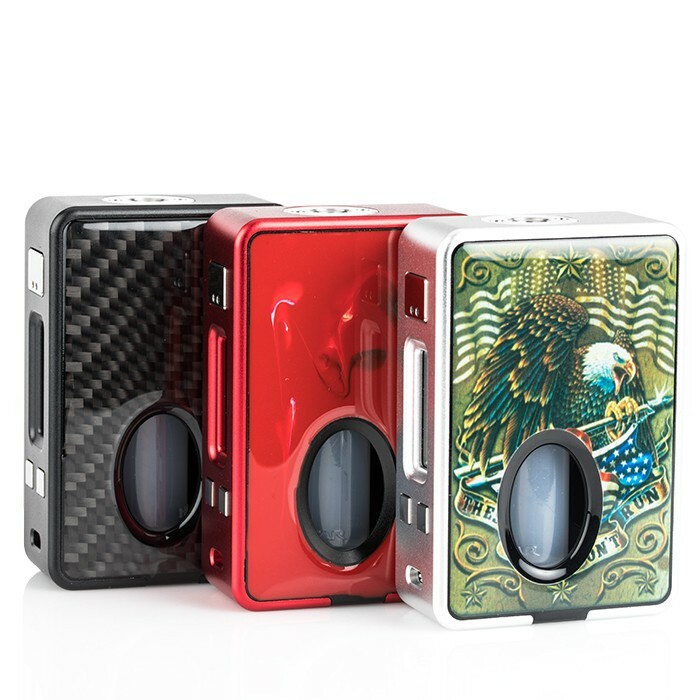 In other words, a simple, no-nonsense squonk box, modernized to meet current standards. Enter the 80-watt Asmodus x Ultroner Luna mod. Temp control-loving, fine-tune-friendly squonk vapers, feel free to scroll down to the next recap. Because there’s nothing for you to see here. But if you just want to set it and forget it, the gorgeous, stabilized wood Luna is WELL worth a deeper look. Because very few straightforward box mods hit this many highs in their stock format. Even with a somewhat limiting 80-watt max output, the Luna is amazingly smooth and powerful, with effortless squonk performance, surprisingly good battery life for a direct-wattage mod, and outstanding ramp-up speed. And, once you get used to the direct-wattage format, you’ll swear you can feel the Luna’s internals adjusting to accommodate different types of coils, since the power output never exceeded the capabilities of the builds we threw at it. While we still haven’t seen the 2×700 Luna we requested at the end of our review, more than a few of us are holding out hope that one is on the horizon, so we can enjoy even more power and performance from the Asmodus braintrust. If you’re in the market for a gorgeous, unique, simplified vape, you should definitely consider the Luna. Continuing the low-maintenance/high-performance theme, we loved the Wismec Luxotic Resin squonk box for its sheer simplicity (with just enough modern protection measures to reassure our not-quite-old-school souls). Instead of loading another box mod full of features and modes and doodads and thingamabobs, Wismec reached back to the salad days of vaping, and focused on pure power. So, there aren’t any USB ports for upgrading or charging. No displays to interfere with instinct. And no cloud-enhancing effects to get in the way of flavor. In fact, the Luxotic might be one of the most-flavorful squonk mod vapes we’ve enjoyed to date. But, regardless of build, the Luxotic continued to offer fast ramping draws and near-flawless flavor. Even the stiff squonk bottles – a concern of mine in the review – softened considerably, becoming more than pliable enough to operate with one finger, but stiff enough to prevent oversquonking. And the shallow, tiny Tobhino RDA is a big part of the success. While users will have to be VERY careful of flooding the deck with errant squeezes, the atomizer itself lent itself to huge flavor and ample cloud production. Plus it was versatile enough to accommodate low-resistance builds and MTL setups alike, with the Luxotic mod effortlessly adjusting itself on the fly. Though we always get a little hesitant to push mechanical setups, and wish there was SOME kind of readout to reassure us things are operating safely, the Luxotic has never once given us a reason for concern. And believe me when I say we’re all using it consistently each and every day. For flavor-hungry vapers looking to lessen their dependence on technology and focus more on what really matters, the Luxotic hits a ton of heavenly notes. 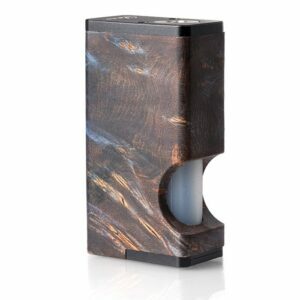 It almost feels a bit weird to include the VandyVape Pulse 80W squonk mod on this list, since SO many people probably already own one, based on reputation alone. And this was the attitude that pervaded our initial review of the Pulse – perhaps unfairly. After all, it came in flaunting a GENE chipset, even though that wasn’t the case. And then there was the underwhelming menu system and TC functionality because of it, which also affected our opinions. But months later, after the dust settled, we noticed that the VandyVape Pulse was still getting a lot of use by our team. Maybe we were jaded, maybe we just were unfair. But that didn’t stop us from returning to the mod whenever we needed straightforward power and performance without a lot of surprises. When kept in power mode (or bypass mode, for the truly old-fashioned purists out there) the Pulse delivers flavor and vapor in a very big way, using whatever BF-RDAs (our top 10 best BF-RDAs) you have in your collection. And those “antiquated” menu trees? They work just fine once you get used to them. Again, sometimes less really IS more. And maybe having a fully featured GENE chipset would have just confused the issue further. Sure, it would have probably made the Pulse a more efficient, powerful device. But would it make it more enjoyable and fuss-free? Not likely. The VandyVape Pulse BF 80 regulated squonk mod is easy to use and fun to vape. The flavor and performance is stellar, and the smooth, leak-free squonking is effortless no matter how you hold the mod. 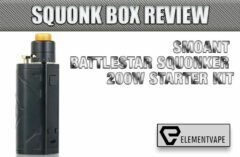 Like I said in the review, these qualities might not be as headline-worthy as VandyVape’s fans seem to think, but squonk fans have an awful lot to like in the Pulse. Just ask the ones around our offices. Okay, some of you LIKE more complex, advanced vape mods. Okay, we have you covered. 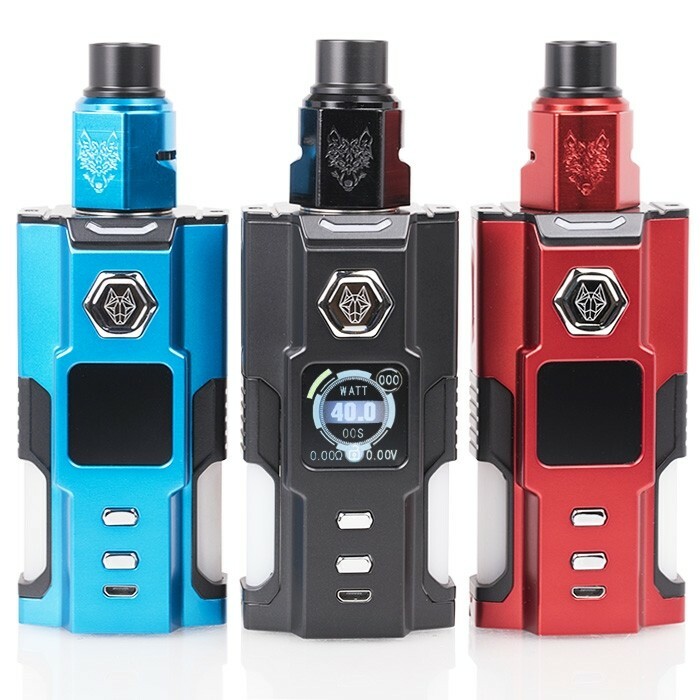 Take, for example, the Sigelei SnowWolf VFENG 21700 dual-squonk mod kit. Yeah, that was a mouthful… and so is the VFENG’s feature list! Powered by a single 18650, 20700 or 21700 battery, the VFENG gives users a PAIR of 3mL squonk bottles to squeeze until the cows come home. And these items surround a powerful, capable chipset, offering up to 130 watts of output. Even though this implies a larger, more-cumbersome vape device, the VFENG is surprisingly ergonomic and well-machined. It’s also surprisingly capable, with a full temperature control suite, laser-precise TCR adjustments, bright, legible OLED display and a ton of other features we don’t have space to cover here. Just imagine your deepest vaping experience and add squonk capabilities. For all this technology, the VFENG is also pleasingly frugal on battery life, with a single 21700 giving me more performance than I ever expected from a bottom-feeding squonk mod. 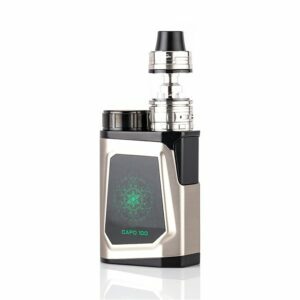 And if you find yourself in a pinch, the mod also has a rapid 2-amp onboard charging feature that gets the VFENG to usable levels in minutes, not hours. While all of this might seem like overkill to some, SnowWolf has never been about subtlety in their mods. And the VFENG squonk mod definitely continues that trend. If you want a monster squonk box that doesn’t skimp on options, take a closer look at SnowWolf’s latest. Sometimes, even after reviewing so many vape devices, we find ourselves latching onto a few for no particular reason. Maybe these mods aren’t the biggest, baddest or even best ones we’ve seen in any category, but they manage to worm their way into our subconscious and not let go. Consider the Aleader Bhive squonk mod one of them. Because, in 2018, there’s nothing too “standout” about a 100-watt squonker with a 24mm RDA and side-positioned bottle port. And that’s precisely what the Bhive brings to the table. But for some reason, it hasn’t left my side since arriving a few weeks ago. And I don’t see it going anywhere, either. Maybe it’s the Bhive’s ultra-sturdy zinc alloy construction. The smooth, glossy “beehive” accents perfectly offset the angular, matte frame, creating a visually interesting device that’s also comfortable to hold for extended periods. Though we might have preferred slightly rounded edges on the matte sections, ultimately, we had no issues with comfort and usability. We also wish there was a little more capacity in the 7mL squonk bottle, but we also noticed that the bottle itself allowed for a little more “overfilling” than most renditions, which tend to leak the instant you cross over that imaginary fill line. Plus, by keeping the bottle size smaller, Aleader was able to keep the overall footprint to a comfortable minimum. In action, the Bhive rises to the occasion, with smooth ramping all the way to its 100-watt maximum, pulse-free performance, and a surprisingly leak-free squonk experience. And the temperature control modes were refreshingly accurate, with little variance in coil resistances, solid coil detection, and a reassuring TCR mode for when your more complex builds aren’t reading the way you’d like. It might just be the best TC performance we’ve seen on a squonk mod yet. We JUST got this kit in, so we’re going to reserve our opinion of the included Beehive 24mm RDA until the full review hits the streets, but suffice it to say, we’re anticipating a similar response to this understated atomizer. Overall that’s the vibe the Aleader Bhive squonk mod gives off – comfortable, high-performing, surprising, and reliable. Maybe there’s nothing EXTRAORDINARY here, but since when does a standout feature or addition define the way a product vapes? It doesn’t, and that’s why this excellent little squonk box is sitting on this list. Normally, the final spot in a Top Ten List is reserved for the “best” product. Or the most popular. Or the best selling. Here, I’m reserving this spot for the most unique squonk mod on the market. And it’s not unique because of its diminutive size, or its fuss-free design. It’s here because it’s the only mouth-to-lung (MTL) focused squonker we’re aware of today. Sure, other BF mods are certainly capable of MTL use – just attach an appropriate atomizer and adjust accordingly. But we can’t recall anyone creating a true, compact, MTL squonk mod JUST for this audience. And who better to pull it off than VandyVape, which is a leader in the resurgent MTL vape marketplace. The Simple EX is a tiny, palm-friendly squonker that comes with everything a newcomer needs to get started in this area of advanced vaping. Featuring a simple, voltage-driven format, the Simple EX is adjustable from 3.3 to 4.5V, and protected by a full complement of security features to ensure new vapers don’t get in over their heads. The equally simple OLED screen conveys all important device information without overwhelming users, and keeps any necessary warnings front and center, in case something goes awry. The 21mm companion RDA comes with a pair of 1.24-ohm, MTL focused clapton coils, which were outstanding in delivering smooth firing, flavorful performance. While they were certainly high-resistance, there was no choking or lack of juice flow to be found. Likewise, the suitably narrow chimney and drip tip offered a nice, snug MTL draw, but not so tight that other vapers couldn’t enjoy it, as well. The best part? The integrated battery was extremely long-lasting, meaning casual vapers will enjoy a full day of vaping – often on just one fill of the 4mL squonk bottle – before having to recharge. And the rapid onboard charging ensures users will be back up and running within a very short window of time. Will cloud fiends and “extreme” vapers find a lot of enjoyment here? Probably not. But for new vapers, flavor-seekers, or people who want a simpler, less-complicated vape, the VandyVape Simple EX is an outstanding device, well worth your attention. There’s clearly many more squonk mods and kits available than we could ever cover in one article, so our expert team put their heads together to devise a list of what we feel are the best of the best, in an ever-crowding market. 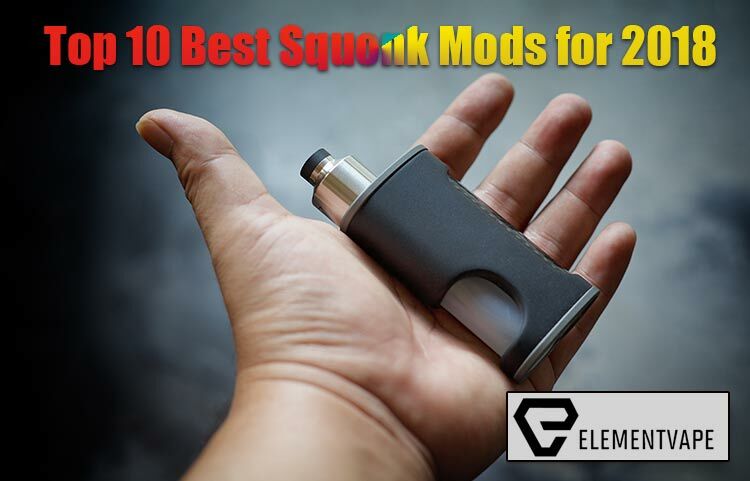 As always, these “Top Ten” lists are subjective, so be sure to reach out to us on social media and let us know which world-beating squonk mod we missed – we’d love to hear from you!